Since it first started providing air passenger services in 2000, JetBlue has been innovating. It was the first airline to embrace dot.com transactions and electronic ticketing, and continues to churn out industry-leading inventions. 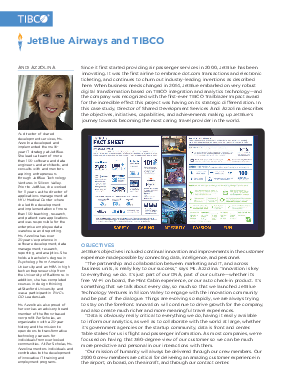 When business needs changed in 2014, JetBlue embarked on very robust digital transformation based on TIBCO integration and analytics technology—and the company was recognized with the first-ever TIBCO Trailblazer Impact award for the incredible effect this project was having on its strategic differentiation. In this case study, Director of Shared Development Services Andi Azzolina describes the objectives, initiatives, capabilities, and achievements making up JetBlue’s journey towards becoming the most caring travel provider in the world.